Notes from a short business trip to Doha, Qatar! Wow it's hot. Still, I dragged myself away from the comfort of an air conditioned room last night and took a taxi (about $2US) down to the Corniche to get a dusk time view of the skyline, which is admittedly impressive. The architects of the buildings here have collectively done a good job of making it pretty striking and attractive at night. The Corniche itself is quite pleasant, even if the night time breeze makes it feel like standing in the blast from an oversized hair drier with the heat turned to maximum. 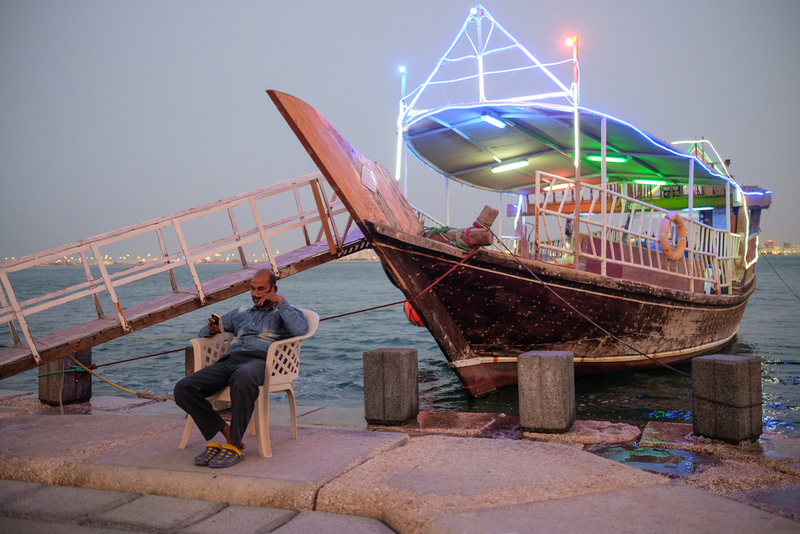 Captains of Dhows await their passengers in the night time heat, balanced on plastic chairs playing on mobile phones.